Are you a busy parent not having enough time for your online business? On this week’s episode, we’re going to help you find 3-5 hours of time to start, build, and grow a successful online business. These are tried and tested strategies that we apply in our daily routines whenever we get pressed for time. Are you a time-pressed entrepreneur? This episode will help you step up your time management skills, and help you stay laser-focused on your goals. Are you a time-pressed parent? This episode is for you, online business or no online business. If you’ve been pushing that thing you said you’d do farther and farther away on your calendar, you’re going to find heaps of insight to finally find, make and take control of your time. So, stick around and ready your thinking hats, ’cause it’s TIME to flip your life. Step 1: Always look at how you’re spending your time. To be able to spend your time wisely, you need a firm understanding of your routines, you need to be honest with yourself and in what you need to do to transform your life for the better. Remember, you need to work hard and work smart to become successful. Often times, we become blindsided by the sense of security brought about by our daily routine. You might think that you’re doing everything to move your life forward, when in fact, more opportunities would have presented itself if you had been more mindful of how you’re spending your time. Non-negotiables – blocked time meant for things you NEED to do: Eat, sleep, spend time with kids, work, etc. Negotiables – time you spend on activities you want, but could otherwise have been spent on more productive endeavors: Watch TV, play games on your phone, etc. When you see the freed blocks of time right in front of you, you’d be surprised to know that YOU ACTUALLY DO HAVE THE TIME TO DO WHAT YOU SAID YOU SHOULD BE DOING – yeah, those things you said months / years ago. Step 2: Make time for more important things. Stop wasting your time hesitating and second-guessing! You’ve just shed some light on the things that truly matter, it’s about time to work on making the right adjustments to start living the life you’ve always dreamed of. Wouldn’t you rather be leagues closer to success by making time for what’s important and taking action, than holding yourself back with all those excuses? If you’ve found a good hour or two (trust us, you will! ), use it to launch yourself forward. If you haven’t, well… roll up your sleeves, and MAKE TIME to put yourself in that catapult, because if you don’t set yourself up for success, no one else will. Take control of your time, before it takes control of you. Saying “NO” comes with a price. There will be raised eyebrows, there will be resistance to your shifting gears, but success is a labor of love, as with anything born out of love, you’ve got to be prepared to make some sacrifices. You need to say no to things that are holding you back from your goal, this can be activities you really enjoy, like watching TV or nights out, etc., but remember, this is only temporary. You can go and do all these things again, as soon as you secure your spot and establish your online business. The sacrifices you’re doing is meant to help you lay the foundation that will significantly improve your family’s life as well as those in need of your content and expertise. Sure, some people will stay, and some will go, but you’d rather have the people staying with you for all the right reasons than be with those who blindly and sometimes selfishly prevent you from living and leading a better life. So, there you have it! How to manage time better even when you think there’s none left. NOW, GO and FLIP YOUR LIFE! Today’s success story comes from Jacqui Smith. 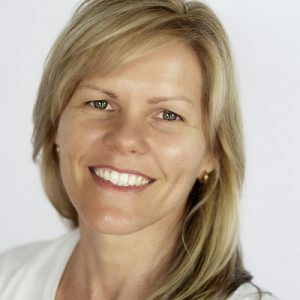 Jacqui is one of our international members, she is from Australia. I love her tagline in our forums, in her signature, because what she does online is that she helps busy moms plan and organize their day with less overwhelm. Jocelyn and I love Australian and British accents. Jackie, you make us smile! Jacqui says, “I only released my playbook on Christmas eve. I put it in my store and emailed my list with a Merry Christmas message and let them know that it was now available. Over the past week, I have sold 6. I totally crashed the homeschool meetup from the Flip Your Life members and Jacqui was on the call, and everybody was freaking out. It was a blast! We had an amazing discussion. It was like Friday night, like 8:05. I just happened to open the forums and see that. It was great stuff hearing all the people supporting each other, meeting in person, talking in the forums. Jackie, we’re really really proud of you for selling those 6 playbooks while you were on holidays. Today’s Can’t Miss Moment is our Christmas decoration this year. One of the things I have always wanted my entire life was the ability to be able to pay someone to decorate things for me. I am okay at decorating, I guess you’d say, but it takes me forever. It takes up a lot of my mental space, and this year in particular I just didn’t have time to do it because we went on a trip in November, Shane and I both got really sick, and then in December we went on another trip, and then there’s the holidays. We were hosting a Christmas party this year, and I wanted the house to look really nice, so I was able to hire someone to come in and decorate my tree. She did an amazing job, so much better than I ever could have done myself. Another thing about it is that we have a second tree and we were able to spend time with our kids and let them decorate it. They put all their little ornaments they made from school, and just all different kinds of family things that we’ve had from the past, and we decorated the upstairs tree ourselves. I love this can’t miss moment because it allowed us to decorate the downstairs the way we wanted it for company, but it freed up that time and mental space to actually enjoy spending time with the kids decorating the tree. They love decorating the tree, it was just an awesome experience. 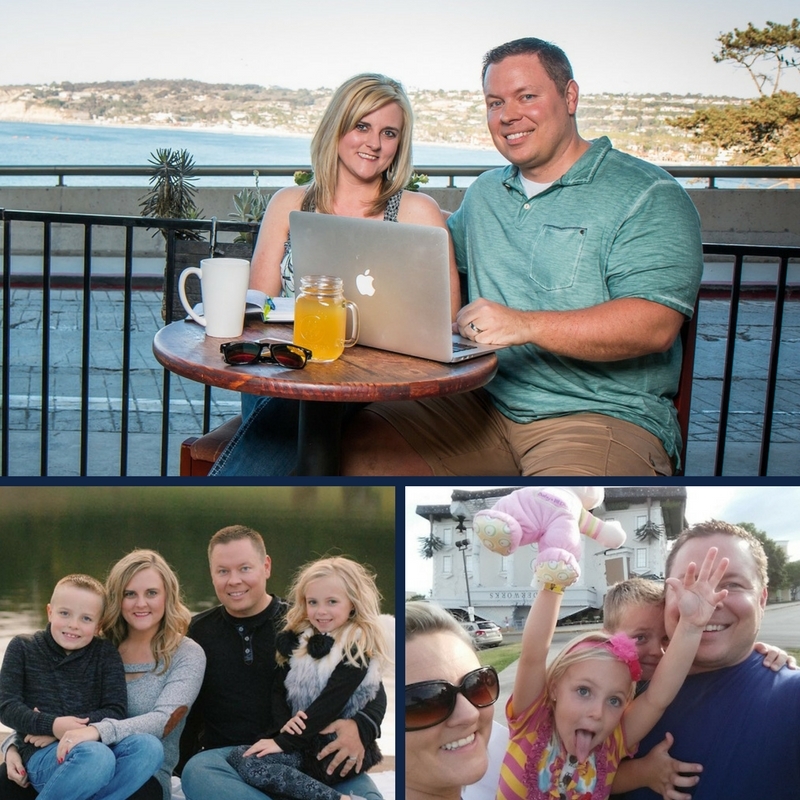 I can remember back when we were both working full time, raising kids, trying to get this online business thing going and we were just working daylight til dark. Sometimes we put our tree up a week before Christmas because we just didn’t have time to get it all done. It was just amazing to see the fruit of our labor, be able to go out and get the help we needed to not only get that stuff done off our plate, but to be able to enjoy that experience with our kids instead of throwing up a tree at the last second before Santa Claus came down the chimney. JOCELYN: Hey y’all! On today’s podcast, we’re going to show you how to find the time to make money online. 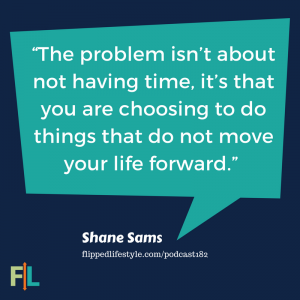 SHANE: Welcome to the Flipped Lifestyle Podcast, where life always comes before work. We’re your hosts, Shane and Jocelyn Sams. What’s going everybody? 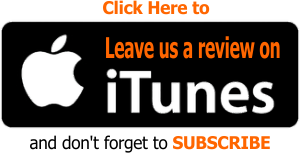 Welcome back to the Flipped Lifestyle Podcast. It is great to be back with you again this week! 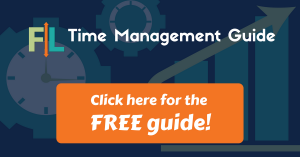 We’re super excited today to talk about one of our favorite topics, and that is TIME — time management, and how to find the time that you need to raise your family, to build relationships, to build your online business. Time is our most valuable resource, and we really need to pay attention to it if we’re going to be able to have enough time to do the things that we want to do. JOCELYN: It’s rough, y’all. One reason that we want to talk about this right now is because we are starting to struggle more with time, especially lately. Our kids are getting older, which I know a lot of people think, “Well, your kids are getting older, and they’re getting easier.” That’s true in some ways, but in other ways it’s harder because they’re involved in more things and we’re going in a lot of different directions. So, what we’re going to talk about today is how we are managing our time. All the tips, tactics, and things we’ve discovered to balance our family life with our work life, and also how we actually found the time to start, build and grow our online business. JOCELYN: We also have a free resource for you guys to help you find all the time that you will need to start, build, and grow your online business. So stick with us, and we will tell you where to find that at the end of today’s show. SHANE: Anytime Jocelyn and I get pressed for time, we go immediately to our calendar and we start looking at all the things that were doing. We have a goal to find 3 to 5 hours of time. There’s always 3 to 5 hours of time hiding in your schedule somewhere. By the end of today’s show, if you implement the strategies that we’re going to talk about today, you will also be able to find 3 to 5 hours per week to work on your online business to get a little more time with your family, or even do some of the things that you’ve been putting off that you want to do for yourself. Along with all the tips and strategies that we’ve discovered to manage our time better and find all this hidden time on our schedule, we really want you to pay special attention to the role that accountability played in our journey. 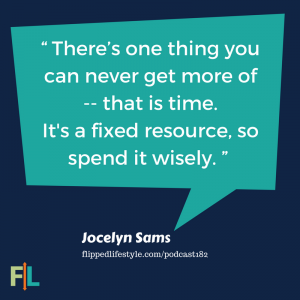 There are a million articles, books, and podcasts written about time management, but without some kind of accountability and a lot of follow through, you’re just going to be spinning your wheels. So really pay special attention when we start talking about accountability. JOCELYN: Alright, so let’s take it back in time to about 5 years ago when we were starting out in our online business. Shane and I at that time, we were working full time jobs. We had two small children — our son, Isaac, was 3; our daughter Anna was 18 months. JOCELYN: The President of the United States. The Queen of England. Everyone has the same amount of time. So what separates people who are successful who are not as successful as they want to be? SHANE: So we looked at each other and said, “We’ve got 168 hours. Everyone on Earth has 168 hours.” Then we asked a question: What are all these successful people doing with their time? We started researching that and looking at that, trying to figure it out, and then we had an epiphany. We said, “Hey, what are we doing with our 168 hours?” That’s what matters, and how does that compare to all of these successful people? We realized, that we were wasting a lot of time, time that we didn’t even know we had because we weren’t paying attention to it. We made a decision that we had to figure out where our time was going. We had to look at the data, we had to take control of that time, and we had to meticulously plan out every hour that we had during the week. All 168 hours had to be planned before we even lived them. JOCELYN: I feel like really the scariest part of that was analyzing what we were currently doing. SHANE: Yeah, gotta look at the truth when you look in the mirror. JOCELYN: I think a lot of times, people want to think, “Oh, I’m taking advantage of every minute of my time. There’s no way I have more time in my life!” But when you start looking at what you’re really doing everyday, you might be surprised. SHANE: So step 1 of our process for time management it to always look at how we are spending our time. That actually comes from a date night that we had in the beginning of our journey. Jocelyn and I asked my mom and dad to watch the kids, and we went out to a Mexican restaurant to eat chips and salsa, to have a good time and to figure out how we were spending our 168 hours. What we decided to do was to physically draw 168 little squares on a piece of paper and write down everything we had done in the last couple of weeks and compare it and see where we were spending out time. I couldn’t find a piece of paper, that was actually big enough to do this, so I went to Walmart and got one of those big, giant accounting columnar pad things with 12 rows and 12 columns in it. We ripped that out, flipped it over, and we literally drew on the back of this paper with a pencil 168 squares. We drew a big grid, we brought all kind of crayons and markers and highlighters and stuff. So, here we are, two grown adults sitting at a Mexican restaurant eating chips and salsa, and it looks like we’re coloring while we’re doing this. JOCELYN: So, here we are, drawing squares, on a piece of paper with a bunch of coloring materials. Luckily, we didn’t really run into anybody we knew or anything like that, but the thing about it is, that thing that we did — sitting there on the table just drawing squares on a piece of paper — that was one of the things that really changed our lives. It sounds so simple, but yet so impactful. SHANE: So, what we did was, after we go our squares drawn, we looked at each other and we said, “Okay, what are the current non-negotiables?” The things that are literally so fixed on this schedule, we cannot change them. Of course the first thing we wrote down as sleep. When do we sleep? We actually found the time that we went to bed every night, maybe it was like 10 o’clock, and we drew the line down to 6, and the we colored all of that like black. We said, “Okay, those were the times we were asleep.” There’s absolutely no way to change that because we all have to sleep. What are other basic needs that are non-negotiable? Well, we’re eating during the day, guys. You get up and eat breakfast, that’s gonna take 15, 30 minutes, whatever it takes you, making coffee, all of that stuff. We started putting in the day to day things in our life – like eating, like going to the gym, and things like that – so that we can see what was going on there. The next thing we did was we wrote down work, we gotta go to work. You guys out there who are still working 9 to 5 jobs, you got to to pay your bills, got to take care of your family. We put work down next when we were writing down all of the things we had to do. JOCELYN: One thing that I realized as I was looking into our schedule is that we actually had some time to learn things about online business even though we were doing things like commuting. From the house that we used to live in, it took me about 30 minutes to get to my job. What a perfect time to listen to a podcast! JOCELYN: When you start thinking about it, most of us work about 40 hours a week, which leaves us about 128 hours, then we’re sleeping I guess roughly 40 hours a week. You still have a lot of hours left when you start thinking about it. We started looking at other things. What else are we doing with our time? Yes, we have to eat dinner and we have to take care of the kids and bathe them, we have to bathe ourselves, bathing is important. (laughs) and, there are some other little things that you have to do in there that do take some time, but what on earth were we doing with the other hours? SHANE: What was happening from 7 to 11 every evening and why weren’t we using that for online business? So we started looking at ourselves and we said, “Hey, what did we do last Sunday night before bed?” Well, maybe I got on the computer and played on Facebook, and Jocelyn watched a TV show or something. Well, what did we do on Monday night? We went out to eat, then we stopped by someone’s house where we hung out for a little while. It wasn’t really like a fun planned thing, it was just seeing what we were doing, most of the time we all were playing on our phones. Maybe we were going here, maybe we were going there. Whatever we were doing, we realized, what if we switched that time over to online business time? What if we said, “Let’s not do those things, and let’s do something else,” because we do all have a finite amount of time. The problem is not that we don’t have time, is that we are choosing to do things that do not move our lives forward and do not help us instead of doing the things that could change our lives and change our family trees forever. JOCELYN: The thing about it is, this exercise, if you start putting it down in black and white, that means that you are seeing what it really looks like in your week. Before you do that, you probably think to yourself, “I don’t waste a lot of time,” but when you start writing it down, it’s really surprising how much time we waste every single day. SHANE: When you write down, “Oh, I watched Netflix for 3 hours,” but then you say you don’t have time? Sorry, you have time. When you write down, “Oh, I was on the phone with my best friend for 4 hours,” and we were just talking and laughing. Maybe that was fun, but really we weren’t getting anything accomplished, just hanging out and having fun. Couldn’t that have been a 2 hour conversation instead of 4? SHANE: Just introvert and don’t even do that, know what I mean? If you look back at the last week and think about all the things you did, you’ll realize, you were probably wasting time. 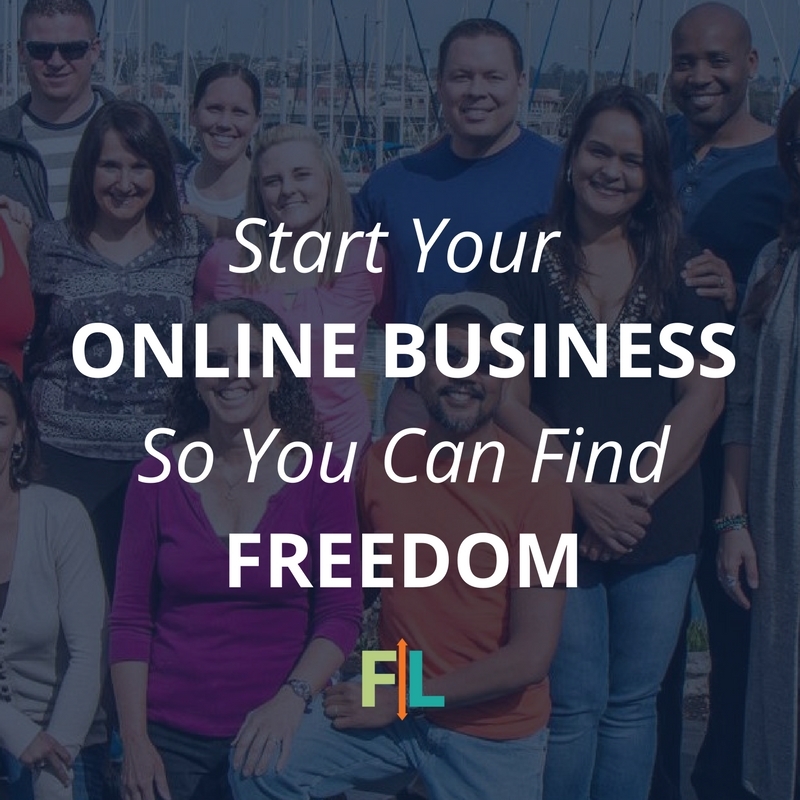 The reason you’re not finding time for your online business is because you might be a little scared to look at it. JOCELYN: We were so serious about this that we decided, okay… one of the things that we’re doing to waste time is watching television. We’re gonna cancel cable. We’re turning it off. I remember this was actually about 4 years ago, because the Winter Olympics were getting ready to come on, and y’all I love the Olympics. I’m obsessed with the Olympics. I watch as many events as possible. I just love it. SHANE: She’s literally like the person that’s watching all of the curling. She’s watching badminton… you name the Olympic sport, she’s gonna be watching it. JOCELYN: I just love that every single time it comes around, but I was going to have to miss the Olympics. We were serious enough about having a different life that I was even willing to sacrifice watching the last Winter Olympics because I wanted to make sure that we were able to grow this business. SHANE: We were scared of temptation, like watching TV or wasting time. So Jocelyn, to make sure she did that, cancelled cable. She cancelled our cable outright. Not only did we get the $100 a month back that we were spending on cable to invest on online business, but we were dead serious that nothing was going to distract us from getting the ball moving forward and changing our lives. JOCELYN: Another thing that I did that I still do this day is that I turn notifications off my phone. If somebody likes my comment on Facebook, I don’t know about it until I log in again. If you are not doing this right now, and you are trying to grow a business, I highly encourage you to turn off all notifications on anything. The only notifications I get on my phone are text messages. Otherwise, everything waits for me. SHANE: I even noticed too when we were talking about how we can learn more in the car, I just realized that in the morning, I would always sit and play my voicemail — the first 10 to 15 minutes of all the people who had called me the day before. While we were talking about it, I was like, “Gosh, if you add that up, that’s like 15 minutes every morning of my life, that means everyday is 30 minutes, every 4 days is an hour, every 8 days is 2 hours of my life. Pretty much 2 hours of my week were gone just by listening to people’s voicemails. 9 times out of 10, the voice mails weren’t even important, and 10 times out of 10 they weren’t an emergency. They didn’t even have to be dealt with on a voicemail. They could have emailed me or something.” So I actually cancelled my voicemail on my phone, just so people couldn’t steal 15 minutes a day from my life of me checking voicemail. And you know what? We still don’t have voicemail. We never set it up back on again, because we realized every 4 days we were saving an hour of our life. What happens every hundred days? Look at all the time that you’re saving just by doing something simple like that, and if it’s an emergency, is a voicemail really going to help you? It’s not like someone’s like, “Pull me out of the well! I need help now!”, “Oh sorry, I didn’t get that voicemail till the next day anyways.” It’s just irrelevant time wasters that are really stealing all of this time you could be working on your online business. So guys just like us, you’re probably not finding the time, or you feel like you don’t have time, because you are not being honest with yourself on how you’re actually spending your time. And until you sit down and you draw that 168 hour squares, print something out that will help you do it, you are not going to know exactly how you’re actually spending your time. Don’t trust your calendar right away. You need to go hour by hour and journal this for a week. Live your life, look at everything you are doing. Look back on it and say, “Seriously, where did my 168 hours go?” You’ve got to sit down and make the time to do this. JOCELYN: Alright, at this point, you’re probably thinking, “That sounds great, but I don’t have time to draw 168 squares, and plan out and figure out where my time is going.” Guys, we didn’t have time to do it either. We had to get someone to watch our kids so that we could have one hour to go and do this. So is it important to you? It’s the same thing I say all the time. One of my favorite quotes is, “If it’s important to you, you’ll find a way; if it’s not, you’ll find an excuse.” So are you going to find a way, or are you going to find an excuse? I can’t imagine where our life would be right now if we had just said, “Well, we made a little money online, but we just don’t have time,” or “Man, we just don’t have time to try this anymore, let’s just go on at our 60 years of 9-to-5-ing until we get to retire, and lay down and die.” No, we made the time. If you are saying that, if you’re saying, “Oh, I just don’t have time to sit down and figure this out” or “I don’t have time to start an online business,” but you want your life to change? And I assume you do, because you’re listening to our podcast. It will never change until you make the time, until you look for the time, you will never find the time to make your dreams come true. Let’s invest in this time that God has given us into building a better future, into getting more time, more money and more resources back later. Until you do that, it’s not going to happen. JOCELYN: The only reason that we’re able to live the Flipped Lifestyle today is because we invested this time when we first got started. JOCELYN: That’s why I’m sitting here on a rope recording this podcast. SHANE: Exactly! That’s why we’re going to be in the bus stop here in about an hour picking up our kids and taking them on trips this weekend. It’s because we invested our time back then. SHANE: You don’t gotta get your 64 pack of Crayolas and take it to the Mexican restaurant. JOCELYN: But if you want to, we won’t judge you. SHANE: I won’t judge you, I still use crayons today. JOCELYN: We have made it much easier for you. We have actually made a copy of our printable 168 hour grid so that you can get started faster. If you go to flippedlifestyle.com/findtime, you will find that 168 hour grid, as well as the instructions to take back your time. SHANE: So, basically, what we’re going to do for this episode is we’re going to release our Time Management course, and you’re going to be able to print out the 168 hour grid. You’re going to get to go through the exact process that Jocelyn and I did, but you’re not going to have to figure it out. SHANE: Yup, totally free. Just go to flippedlifestyle.com/findtime. You can print that out. You can watch the course and get that started now so you don’t waste a single second of your time going forward. Alright, so some of you now are probably thinking, “Oh, but I love watching 3 hours of Netflix. I love The Walking Dead on Sunday’s. I love all of these things that I’m doing that are actually wasting my time and I don’t know if I want to give them up.” Look guys, I’m gonna give you some no-sugar-coating or anything right here. Success is not possible unless you change something. I’m sorry to tell you this, but you are going to have to give up a few things for a while so you can get so much more later. You will never find the time if you don’t look for it. If you don’t replace something on your current schedule with online business, your online business is never going to grow. It’s never going to appear, and it’s never going to have a chance to be successful. You can have it all, but only if you earn it. You earn things by sacrificing. We sacrificed things in the beginning, to earn the Flipped Lifestyle that we get to live today. A lot of people who are listening to this, you look at the mirror and you say, “I’m an entrepreneur, I have the entrepreneurial spirit.” You say this and you feel this, but you’re not doing the things, taking the action that it takes to actually be an entrepreneur – to actually be a person who is taking control of their life. Here’s the truth. Entrepreneurs — real entrepreneurs, not want-to-repreneurs or wanna be entrepreneurs — real entrepreneurs do what most people won’t, so that eventually they can live like most people can’t, like most people never will. You just need to go out and pick one thing that you are willing to put aside for a while, not give up forever, but put one thing aside for a while so that you can make your online dreams a reality. JOCELYN: And I just wanted to say that if you change nothing, nothing will change. That’s something that has really meant a lot to me through the years. I was upset when I didn’t get to watch the Olympics 4 years ago, but now I get to watch it in 2018. Really if I wanted to, I could probably even go to the Olympics. SHANE: Literally, this year the Olympics are in South Korea. Jocelyn and I were in South Korea just a little while ago. We actually went over there. We went to Seoul. We went on a tour. We were looking at these palaces and all these things, and if we wanted to, we could take our kids to the Olympics. That never would have been possible if we did not give up watching the Olympics on TV for a while. I think that’s where most people really get hung up is they think, “Oh, I’m giving this up.” No you’re not. You’re just pushing it aside. To make more things that are more important for a time, and then you could resume right where you left off. It’s kind of like when an ambulance is coming. If you see an ambulance in your rear view and you hear the sirens, what does everybody do? They pull over for a time, because something more important is coming through at that moment, and then you just pull right back on the road, and you’re moving to where you want to go. It’s the same thing. You just need to pull over for a time. Put some of those things aside for a few moments and get so much more back in the future. SHANE: The truth is we all have a lot of external pressures. It’s one thing to gather up the willpower and gather up the strength and say, “You know that’s right. I’m going to take control of my time. I make a plan,” but then you got to actually execute it. To do that, you are going to have to say, “NO” to some of those external pressures. Just like you said “no” to some things going on your calendar, there’s going to be some events in your life that you’re going to have to say no to. JOCELYN: And I think this even kind of harder than saying “no” to cable or turning off notifications on your phone or things like that. Saying “no” to people, it can be hard. SHANE: But until you start saying “no” to some of the outside influences on your time, you’re never going to be able to say “yes” to your dreams. You’re never going to be able to say “yes” to the life you want. When we started our online business, we were working 10, 12 hour days, we were leading a Sunday school small group at church, raising two small kids, we know exactly where you’re coming from. We were so overcommitted. When we look at our 168 hour calendar, we realized that we pretty much had 9-11 to get things done, 9pm to 11pm period. It was the only time that we could do it, so we had to be tough and made tough decisions to make that work. The first step is getting rid of things we could control, like stop watching TV at night and working on our online business instead. But then, we had to start saying no to people. People would say, “Hey, you guys want to go out to eat after work tonight? Bring the kids over. Come hang out. Do this, do that,” and we had to start saying, “No, I’m sorry, we can’t do that,” because we had stuff that we had to take care of. Did this affect some relationships in our life? Yes it did. When you start saying no to people, they eventually stop asking. We realized, all the things we were working on, all the things that we were doing, were going to give us the ability to have even better experiences down the road. Those same people that we said no to, we can’t go out to dinner, I’m sorry before? Now we can go out to dinner with them, and we can buy dinner for everybody because we built our online business. The way to remove these external pressures that are draining your energy, that are sucking your willpower dry, is to just say “NO,” and to be ready because people are not going to be ready, guys. You are unique, you are special, you are the 10% of people out there who are listening to podcasts trying to learn how to change your life. When you start taking those actions, there’s going to be resistance to that. You’ve got to resist, you’ve got to say no, because you are saying yes to a better life for you, your family, and your future. So to kind of sum this all up, y’all, success happens when you find the time to make it happen. I would guess that that’s the missing ingredient, that’s why you’re not making progress. That’s why you’re not going forward, is because you’re not actively looking for the time. You’re not forcing it to happen. You’re not taking charge of your calendar. If you’ll just do that, if you’ll just squeeze out an extra 30 minutes a week, what would 30 minutes a week do for your online business? What would an hour to 2 hours a week added to your business work time do to move you towards further success? If you look for the time, you will find it. If you find the time, you will find success in whatever you want to do online. JOCELYN: Alright, we do this podcast because we want to help you. That’s the reason we’re here. We want you to have the kind of life that we have. 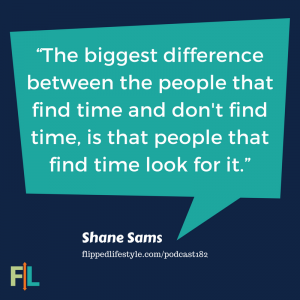 If you need more help figuring out how to find time in your schedule, head over to flippedlifestyle.com/findtime. There you’re going to find our 168 hour grid. It’s already printed out for you, you don’t have to draw squares. We already have that printed out in nice, neat fashion. We’re also going to make our time management course available. 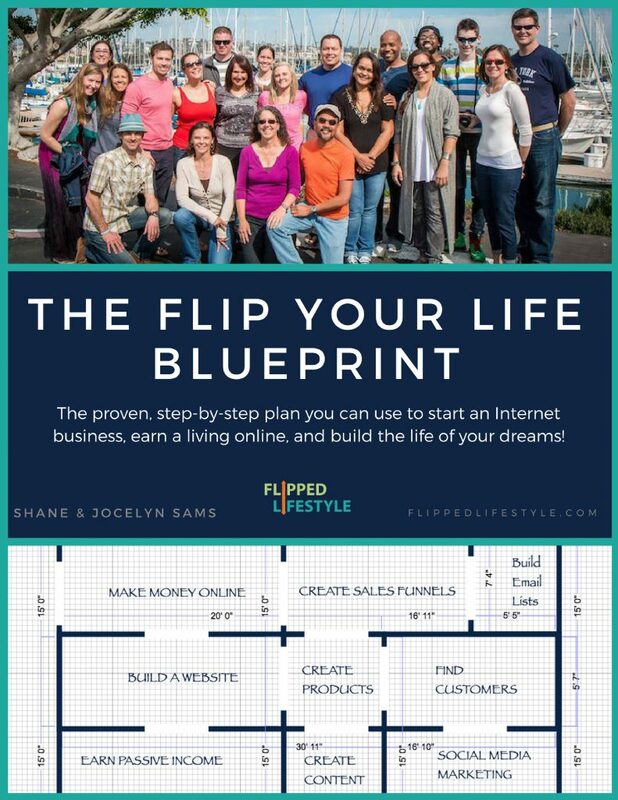 This is something that’s normally only available in our Flip Your Life community, but it is available to our podcast listeners today totally free if you head over to flippedlifestyle.com/findtime. JOCELYN: Guys, we want you to be there. This is an amazing opportunity. Get in, meet us, meet people in our community and make friendships that are going to last a lifetime. Live events have been such a game changer for us. We do not want you to miss out on everything that we have planned for Flip Your Life live 2018. SHANE: We are really making this event for the people who are coming. This is not some sit-and-soak event where we’re going to have a bunch of speakers preaching to you on stage so that they could sell you something at the end of the event. This is going to be designed to help you take your business and your life to the next level. We’re going to have content, amazing content. We’re going to have work time. We’re going to have Q&As with me and Jocelyn. You are going to leave Nashville with a strategic plan to take everything in your business and your life to the next level. This is going to be an amazing event for action taking and fun. It’s going to last from September 19th to September 21st, 2018. Jocelyn and I will be personally leading this event, and every session will be packed with new information with what’s working now in online business. Guys, this event is for everyone. We’re going to have beginner content, there’s people coming with 300, 400, 500 members who have already quit their job and flipped their life, everybody in between. Every single person at this event is going to be able to take action during every session. It’s a really exciting group of action takers, guys. I can’t wait to see you guys there! To get your ticket now, head over to flippedlifestyle.com/nashville, that’s flippedlifestyle.com/nashville. There should be a few tickets left when you hear this, if not it will say, “sold out” at the bottom. We’re really serious, we’re not just saying this, guys. The tickets are almost gone, only a few left, so make sure you head over to flippedlifestyle.com/nashville right now. JOCELYN: Alright, next we are going to move into the Can’t Miss Moments of our show, and these are moments that we were able to experience that we might have missed if we were working at nine-to-five jobs still. Today’s Can’t Miss Moment is our Christmas decoration this year. One of the things I have always wanted my entire life was the ability to be able to pay someone to decorate things for me. I am okay at decorating, I guess you’d say, but it takes me forever. It takes up a lot of my mental space, and this year in particular I just didn’t have time to do it because we went on a trip in November, Shane and I both got really sick, and then in December we went on another trip, and then there’s the holidays. 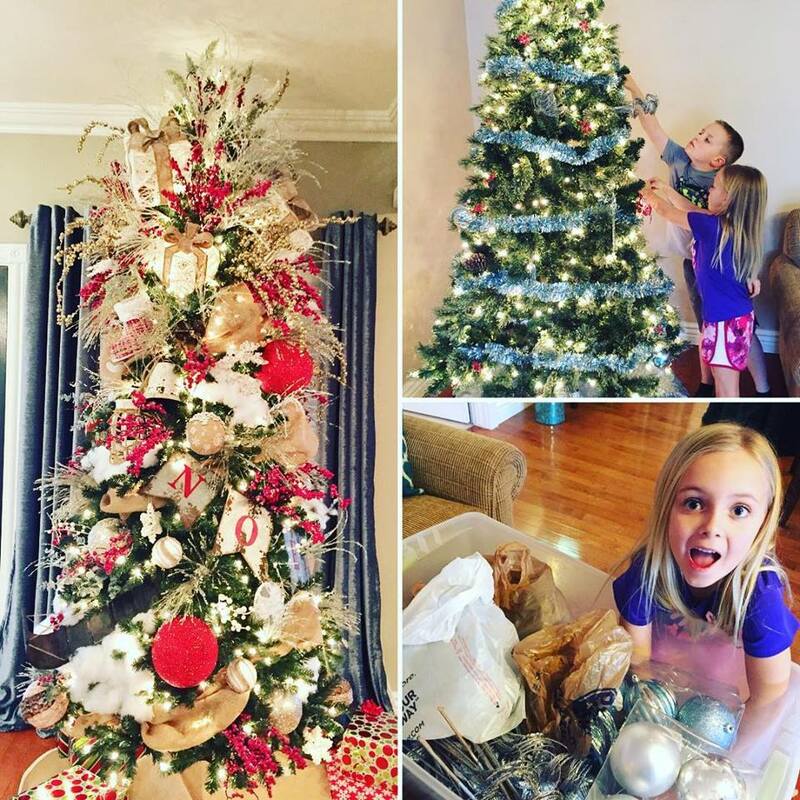 Another thing about it is that we have a second tree and we were able to spend time with our kids and let them decorate it. They put all their little ornaments that they made from school, and just all different kinds of family things that we’ve had from the past, and we decorated the upstairs tree ourselves. SHANE: I love this can’t miss moment because it allowed us to decorate the downstairs the way we wanted it for company, but it freed up that time and mental space to actually enjoy spending time with the kids decorating the tree. They love decorating the tree. It was just an awesome experience. 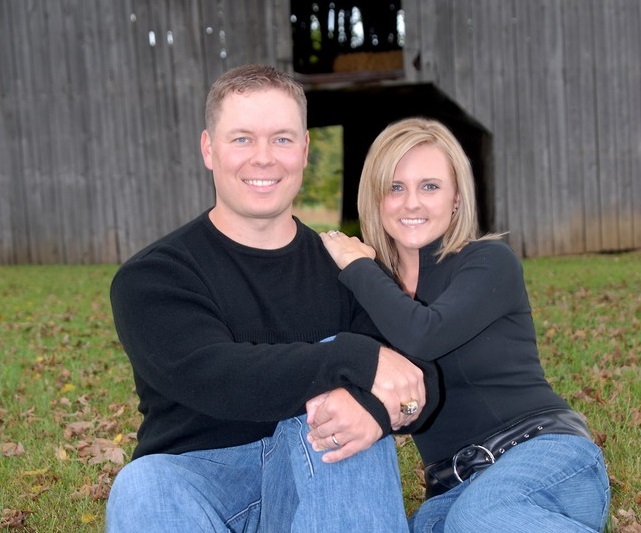 I can remember back when we were both working full time, raising kids, trying to get this online business thing going and we were just working daylight til dark. I can remember sometimes we put our tree up a week before Christmas because we just didn’t have time to get it all done. It was just amazing to see the fruit of our labor, be able to go out and get the help we needed to not only get that stuff done off our plate, but to be able to enjoy that experience with our kids instead of throwing up a tree at the last second before Santa Claus came down the chimney. We love to talk about our can’t miss moments with you guys each week right here on the Flipped Lifestyle podcast, but there’s one thing we’d like to talk about even more, and that is the success stories from the members of our Flip Your Life community. 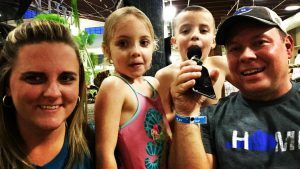 Before we go, I wanted to share and actual success story from the success forums in the Flip Your Life membership. Today’s success story comes from Jackie Smith. Jackie is one of our international members. She is from Australia. I love her tagline in our forums, in her signature, because what she does online is she helps busy moms plan and organize their day with less overwhelm. Jocelyn and I love Australian and British accents. Jackie, you make us smile. SHANE: Two exclamation points on that sentence, by the way. JOCELYN: “One customer emailed me. She was so excited to buy it. Insert big smile here.” We have a big smile for you, Jackie, because we’re really excited for you. And she says, “as you can imagine as I’m yet to really share much about it and show people how to use it with their planners. Thanks for the encouragement to take action, Flip Your Life community. SHANE: Jackie is an amazing member. She’s in the forums everyday, not only asking questions, but she’s also helping so many other people. I was looking at her stats and Jackie has gotten in there and she’s got 20 or 30 topics that she’s started. She’s only been a member for a very short time, but she has almost 300 replies to other posts. That just shows you how amazing the people are in the Flip Your Life community. They’re not only in there for themselves to get the answers to their question, but they’re rallying around each other, helping each other move forward, holding each other accountable. JOCELYN: He totally crashed the Zoom call. SHANE: I totally crashed the homeschool meetup from the Flip Your Life members and Jackie was on the call, and everybody was freaking out. It was a blast! We had an amazing discussion. It was like Friday night, like 8:05. I just happened to open the forums and see that. It was great stuff hearing all the people supporting each other, meeting in person, talking in the forums. Jackie, we’re really really proud of you for selling those 6 playbooks while you were on holidays. SHANE: Before we go today, we like to close every show with a verse from the Bible. Today’s Bible verse comes from 1 Peter 4:10, and it’s all about using your talents to serve other people. The Bible says, “God has given each of you a gift from His great variety of gifts. Use them well to serve one another.” Guys, that’s all you have to do to be successful with your online business. Find that thing that you’re expert enough in. Find that talent, find that gift that God has put deep inside of you. Use that gift to help other people to solve their problems and serve other people, and you will be successful. God would not have put that dream in your heart, that idea in your head, He would not have given you that talent if He did not want you to go use it to serve the world. Don’t waste that gift! You, listening right now, have a gift someone else needs! Only you can help somebody else, you just got to take action and put yourself out there into the world so that those people can find you. Alright guys, that’s all the time we have for this week. Ironically, we are out of time in our time management episode. Can’t wait to join you guys again right here next week for the Flip Lifestyle podcast, and we cannot wait to see you in September in Nashville. Until next time, get out there, do whatever it takes to flip your life!